SOLVED - Application buttons - Symbol buttons - Panel feature or plugin ??? Hi everyone. Recently a buddy of mine showed me his desktop with MX Linux 17.1 XFCE. 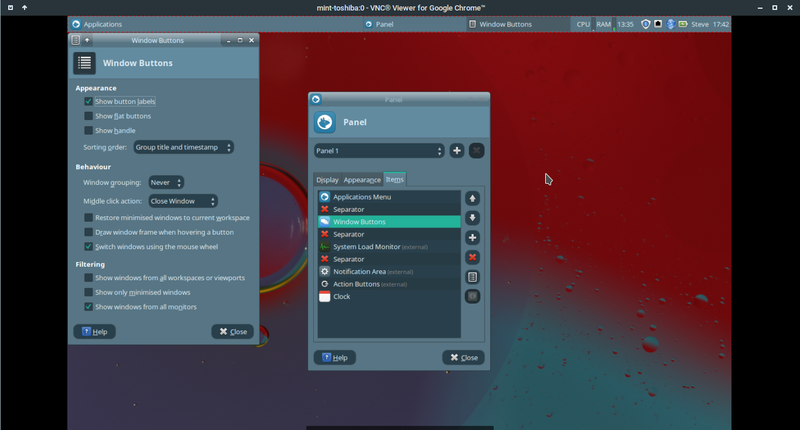 It didn't really look that much different from Mint XFCE, except for one thing that I really really liked. Since both of our machines have the XFCE desktop manager, I'm hoping that is a standard part of XFCE ... which I just can't seem to find anywhere since I wouldn't know what it's called. I did look in the software manager under ... Panel, Button, XFCE ... but couldn't find anything there. Here's what I'm talking about. When I have several applications open on my screen, my bottom panel has a button for each application on the panel. When 6 or 7 things are open, the panel is pretty much filled with the buttons for all of those items. On my buddies machine with MX / XFCE, for every open item on the desktop there's a button that's just the size of the application symbol. In other words, for Firefox he just has another FF symbol, except that it also has the function of a standard Mint / XFCE panel button ... minimize, maximize, right click context menu. When he has 4 or 5 items open on the desktop, all of those items take up the space of just one of my Mint / XFCE buttons. I really like the amount of panel space that's saved with those symbols, as opposed to rectanguar long buttons. I think Windows7 has the same thing, just another symbol for each open item on the desktop. Last edited by LinWinux on Thu May 17, 2018 1:06 pm, edited 1 time in total. Re: Application buttons - Symbol buttons - Panel feature or plugin ??? Right click on the panel, open panel, navigate to items, select window buttons and click on the 5th button down to edit its preferences. You can switch off labels and turn on window-grouping from there. SOLVED - Re: Application buttons - Symbol buttons - Panel feature or plugin ??? Never even dawned on me to check if there's an edit function for the window buttons. Thanks a million ... You Rock !!! Re: SOLVED - Application buttons - Symbol buttons - Panel feature or plugin ?? ?